KRB has updated its comments to the Corps. We have more tightly tied the request for whitewater releases to the particular season threatened by the Corps' project: summer 2021. We have also clarified with the Corps that they intend to remove the pool restriction in "early Spring" 2021 — the slide they presented in Kernville last November is inaccurate. The Corps can't get us a more specific date. KRB is always open to comments and criticism about its positions — they make them stronger — so please contact us with your ideas. A Brief Respite from the KR3 Diversion? Edison today announced its "intent to dewater a water conveyance" at its Kern River No. 3 hydroproject to conduct repairs from March 01 to March 14 of this year. 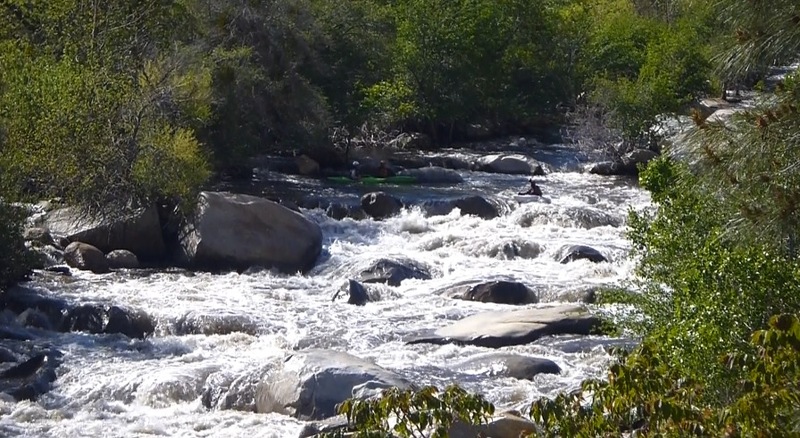 KR3, of course, dewaters 600cfs from the Upper Kern. Hopefully Edison's vague declaration means it will not divert water from the river during that period of time, and thus Chamise, and hopefully more if we get more snowmelt, will be open for business those two weeks. Spring begins in late March, so KRB analyzed the historical April 01 storage data for the Isabella reservoir. The result is that over the last 50 years, storage in the reservoir on April 01 has averaged 204,827 acre-feet. If, contrary to November 17 slide above, "early Spring" is when the Corps is targeting to lift the pool restriction, then around April 01, 2021 storage in the reservoir will be at 72,237 acre-feet, or less. The reservoir has a storage minimum. 30,000 acre-feet are required to remain in the reservoir for lake recreation. Thus, while the April 01 average storage available for river release has been 174,827 acre-feet, on or around April 01, 2021 only 42,237 acre-feet will be available. The pool restriction accordingly limits useable water to 24% of the historical average. Fast forward to the summer of 2021. The watermaster has never released boatable flows with storage in the 72,000 acre-feet range. There is no guarantee the watermaster will release inflows from that season's snowmelt at boatable levels during the summer of 2021, as opposed to using those inflows to fill the reservoir. There may not be sufficient inflows to release at boatable levels should the Southern Sierra experience drought the previous winter. And, of course, project delays could keep the pool restriction in force beyond early Spring 2021. KRB continues to believe the Isabella Dam project's pool restriction will unavoidably damage the 2021 summer boating season on the Kern below the reservoir, and the Corps should mitigate that damage with a regime of "bubble" releases. We found the missing four years of storage data for the Isabella reservoir. Here's the full result. And here's our updated comments. The USACE project mandates that storage on June 01, 2021 be capped at 72,237 acre-feet. Over the last 50 years, the average storage in the reservoir on June 01 has been 302,904 acre-feet. The reservoir has an "unusable" minimum of 30,000 acre-feet. Thus, the project means useable storage on June 01, 2021 will be at 15% of average. (42,237/272,904.) The snowpack will have been substantially, if not fully, depleted. And the watermaster has never provided boatable flows with 70-some thousand acre-feet of storage. Thus, the project means there will be no summer boating season on the Lower Kern in 2021 — and perhaps a year or two after that if there are substantial project delays or if the project is followed by a season or two of drought. This is the adverse effect on whitewater boating the project entails. The Corps should mitigate it, in our opinion, with some regime of "bubble" rec releases.